The 10 Best Places for Mac & Cheese in Iowa! Sometimes it’s the simple things in life that really can keep you going, and creamy cheese dripping off noodles is one of them! If you happen to get a little mac and cheese craving in Iowa, you don’t have to drive very far to satisfy your appetite. Whether you like it loaded with toppings, or you’re more of a traditional person, these 10 best mac and cheese places in Iowa will surely satisfy! Specializing in gourmet cheeses exclusively, it should come as no surprise that the Cheese Shop of Des Moines provides some of the best mac & cheese in the state. There’s two ways to enjoy the mac & cheese provisions from the Cheese Shop, and that is by either bellying up to the Cheese Bar and ordering off the menu, or getting the take-and-bake mac & cheese from the catering menu to bring home. Either way, this state-famous cast iron mac & cheese will provide a high bar for your future mac & cheese standards. Located on the Coralville Strip, Monica’s has plenty of excellent entrees to choose from on their full menu. If you are in the mood for mac & cheese, then the Extraordinary Mac & Cheese from Monica’s is right for you. Featuring gruyere, white cheddar, cojack and smoked gouda cheeses blended together, infused with fusilli noodles and bacon crumbles, and topped with parmesan bread crumbs, Monica’s Extraordinary Mac & Cheese will have drooling over the menu. Serving as a great lunch, brunch, dinner and late-night spot in Des Moines, Americana among many things, has a great tasting mac & cheese recipe on their menu. Featuring a goat cheese cream sauce and peppered brown sugar bacon, plus spinach, roasted mushrooms and toasted bread crumbs, it’s easy to understand why Americana considers their mac & cheese to be loaded. For the younger eaters, mac & cheese also appears on the kid’s menu at Americana, although the recipe could be considered a little more traditional. It’s all about the bread at Saucy Focaccia of Cedar Rapids, and the sauce, and while this award-winning food truck turned restaurant gets big nods for their specialty sandwiches, it’s their side items like the mac & cheese that win over a lot of people’s vote. With four different mac & cheese options to choose from at Saucy Focaccia, including traditional and chili mac, as well as southwest spicy mac & cheese, whatever kind of flavor you’re searching for, you can find it at this laidback eatery. To go alongside your side of mac, it’s highly recommended sampling the other fares from Saucy Focaccia, including the burgers and saucy sandwiches. Born at the Lake of the Ozarks but raised in Iowa, there are only two locations to enjoy Wobbly Boots Roadhouse BBQ, and only one in the state of Iowa. Both the Ozarks and Iowa locations are managed between friends and local Iowa residents, and both provide not only some of the most finger-licking good barbecue, but also a mac & cheese side item that’s worth the visit alone. With each bite of the Wobbly Boots barbecue mac & cheese, you can taste the homemade quality behind the sauce, and whether you pair it with a prime rib dinner, barbecue sandwich or have it on its own, you’ll have just one more reason to visit the Ozarks (or Iowa). Not only is the Clinton Street Social Club a classy establishment to grab a drink in Iowa City, but alongside their long menu of delectable fares, this gastropub has some of the best mac & cheese you’ll find in the state. Featuring cheese from the nearby Milton Creamery, the Clinton Street Social Club also adds a little extra flair to their mac & cheese via sweet peas and hardwood smoked bacon. Whether you’re looking for some live jazz, or a classy place with custom cocktails, or perhaps some mac & cheese (why not all three), then the Clinton Street Social Club needs to be on your short list of where to visit next. Featuring wings, po-boys and specialty sandwiches, Buzzard Billy’s of Des Moines provides many good reasons to visit for lunch and dinner. What might stick out on their long menu of original entrees the most though is the house-made mac & cheese served with a Cajun twist. If you really want to make a full meal of out of Buzzard Billy’s Cajun mac & cheese you can add a blackened chicken breast on top of it. Sweet and meaty, tender and juicy, that is the motto for the Rib Shack of Iowa in Knoxville. Featuring a long menu of amazing barbecue entrees, including their state-famous ribs, one the best additions you can add to any meal at the Rib Shack is the side-item mac & cheese. Science has yet to conclusively prove why barbecue joints make some of the best mac & cheese on the planet, but intuition can tell you it’s the quality of ingredients and time spent perfecting the spit that also translates into great mac & cheese. You really you can’t go wrong at the Rib Shack with whatever entree or side-item you choose, and with one bite you’ll quickly see why you will be coming back for more. Located in the historic Valley Junction in West Des Moines, Cooper’s on 5th strives to provide upscale dining in a laidback atmosphere. Whether you go for the burgers, sandwiches or soup, no real visit to Coopers is complete without sampling their homemade mac & cheese. 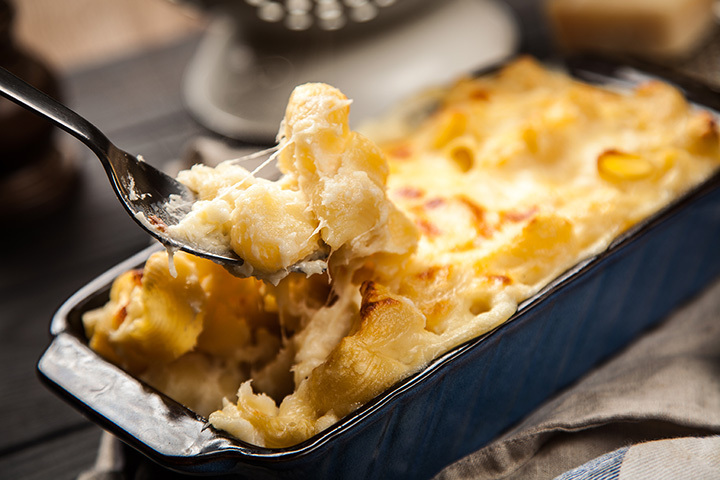 Featuring jumbo shells and a four-cheese blend, including house-smoked gouda, the mac & cheese at Coopers is rich in flavor and oozing with deliciousness. The smoked gouda mac & cheese is easily a favorite of Cooper’s on 5th, but with a long menu of other tantalizing entrees and appetizers, many visits are needed for the full Cooper’s experience. Foodies and craft beer patrons alike unite each year the annual Mac & Cheese Festival held in Dubuque. Perhaps sporting the best combination of food and drink ever created, everyone who visits the often-sold-out Mac & Cheese Fest is truly a winner. Featuring many samples and smells of the state’s best mac & cheese recipes, there is also plenty of craft beer to go around as well. Whether you are looking to eat or to drink, or to be simply around other people with the same priorities in life, get your tickets now for Mac & Cheese Fest in Dubuque.